In the summer, our apartment is like a fiery inferno when it becomes super hot outside. So, during the heat wave last month, there was no way I was going to turn the oven on for anything. Good thing, we had a good mixture of home grown and farmers market vegetables to whip up some homemade potato salad! Potatoes are in abundance right now at the market or even from your own garden, so this can be enjoyed well through the Fall. This recipe was passed down to me from my Peruvian Uncle who says that it is a Peruvian recipe. The shade of the salad will differ depending on the type of beet you use. 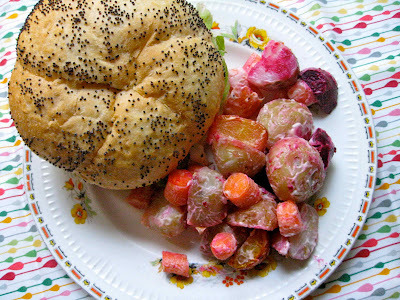 Red beets = red salad (and red fingers!). Boil potatoes and beets. Chop potatoes, beets and carrots into bite sized pieces. Mix in enough mayonaise to make it creamy. I find that one good dollap is enough. Add peas.